Despite years of neglect, the home’s original solid mahogany front doors were restored to their former glory. When the Johnsons purchased this single level home in 2015, a lot of love was certainly needed. The house, which had been built in 1990, had sat empty for three years. Upkeep had been neglected and normal weathering had occurred. For instance, 11 decorative outdoor pillars had completely rotted and the once distinctive solid mahogany front doors looked like driftwood. Work began on the 4,700 square-foot house in December 2015 and the Johnsons moved in just shy of one year later. Work continued until the complete renovation was achieved this past June. 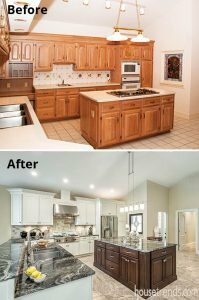 The Johnsons certainly had a huge advantage in tackling this enormous job, as they are the owners of Kitchens By Design, providing kitchen, bath and cabinet work for over 25 years. “Whenever we do a project for ourselves and must make hundreds of decisions, we have even greater empathy for our clients doing the same,” says Cathy. Miles and Cathy did about half of the physical work on their house themselves, using their own subcontractors and other workers for the rest of the project. Design elements used throughout this three-bedroom, four-bathroom home are first noticed as you step in the entry and see the views of rooms with fresh elegance, light, earth-tones, arches and pillars, rich cabinetry, and natural materials. To the left of the entry is the dining room. To the right, the focal point of a lovely office is a wall of arched bookshelves that were preserved and refinished. 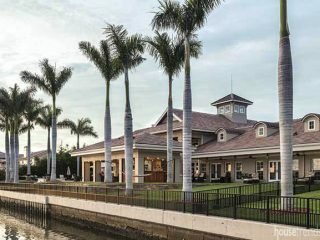 Directly across from the home’s entrance is the 23×20-foot formal living room. 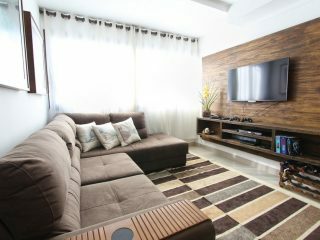 The room’s tasteful furniture has been arranged to provide a cozy atmosphere in a space that could almost be a ballroom. 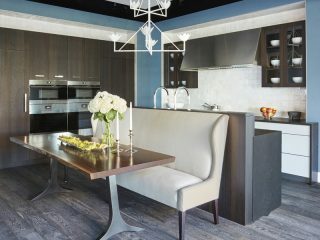 “We wanted a casual grandness to this room, welcoming but still in scale with the architectural features,” says Cathy. 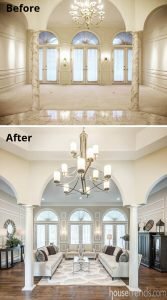 Living room carpeting was replaced with maple hardwood flooring, pink faux marble pillars were painted white, seven-and-a-half-inch baseboards were added, and walls and trim were updated. The living room is the only room that has window treatments other than blinds. It comes as no surprise that Miles and Cathy had the most fun completely redoing the kitchen. The room was completely gutted—removing all trappings of the 1990s, from soffits to oak cabinets. 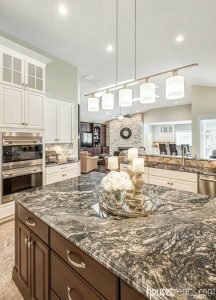 The couple decided on an almost white color for the wall cabinets and the two-tiered island; handsome dark cabinetry was selected for the centerpiece island. Cathy loves “the movement” that the Lava Vecchia granite, with its lines and veins, gives the kitchen. 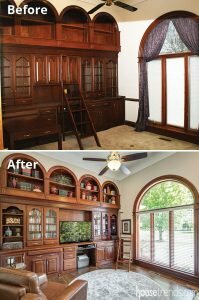 A stained-glass window—that slides open to a wet bar next to the formal living room—was replaced with a leaded-glass piece. Oversized porcelain tile flooring complements the entire look. The kitchen opens to a breakfast room area and the adjoining family room. The pink marble fireplace was brought up-to-date with a stacked stone surround. 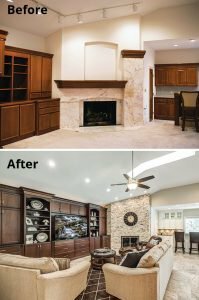 In an effort to tie the entire space together, the Johnsons preserved and refinished the built-in bookcases in the family room to match the kitchen island. The bar and counter area next to the fireplace was also completely redone, while the window that allows a pass-through to outdoor dining areas was preserved. When it came to the master suite, Cathy and Miles set out to create a soothing sanctuary with all the amenities. 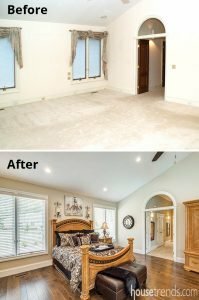 Dated carpet was pulled up and replaced with hardwood in the bedroom, while a wall of cabinetry received a welcoming coat of clean white paint to match all the new cabinetry throughout the house. “Seriously, this house has more storage than anyone needs!” says Cathy with a laugh. 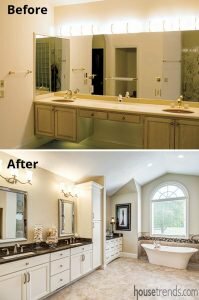 When it came to the master bath, the Johnsons, who have redone so many bathrooms for other people, had a ball redoing this one for themselves. 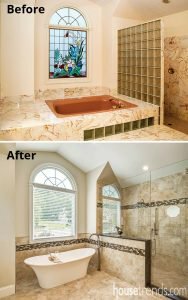 A chic slipper tub replaced a pink tub surrounded by a deck of pink marble; the outdated stained glass window was replaced with a conventional window. New walls, floors, cabinetry and fixtures round out the renovation. 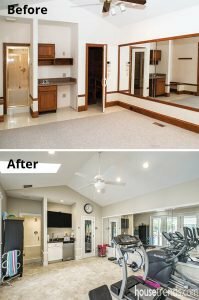 In addition, the master bathroom really became two bathrooms after a section previously devoted to a toilet and stacked laundry area was converted into a separate bathroom for Miles. “It’s the secret to a successful marriage,” says Cathy. 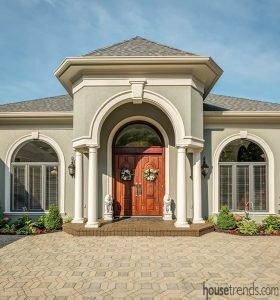 The trademark pillars and arches of the elegant indoors are carried out to the warm and welcoming back yard of the home. 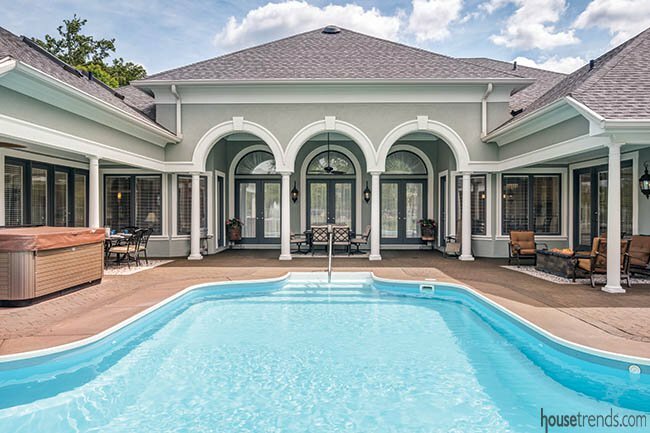 It’s a place where you want to curl up, relax and enjoy the view of the pool and the pond or easily entertain family and friends. But when Miles and Cathy first saw the outdoor area, the run-down exterior featured a swimming pool that was home to five bullfrogs and two feet of sludge. But just as with the home interior, the couple saw the potential. Miles and his daughter drained, scraped and refinished the pool, making it the sparkling focal point of the back yard. The pool is surrounded on three sides by welcoming covered patios. 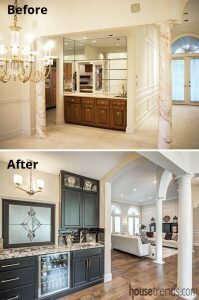 All surfaces were redone to make this a stunning showplace. 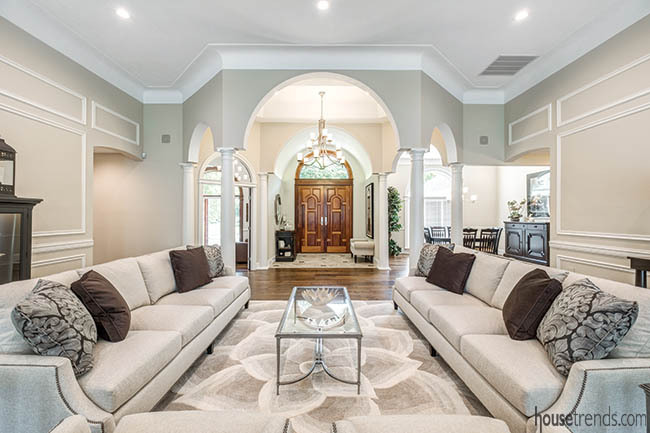 Four sitting and dining areas allow the couple to host their church group for a cookout or have family fun with their two grown children and three grandchildren. Soon the couple will be installing an outdoor kitchen.